Hello everyone and welcome! 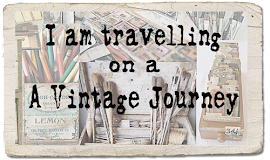 Jump aboard and travel along with us on the next leg of our vintage journey! 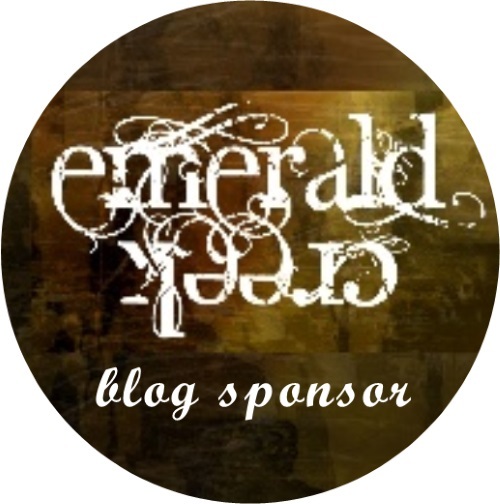 This is Astrid, your host for the first leg of our September weekly Monday inspiration travel posts. 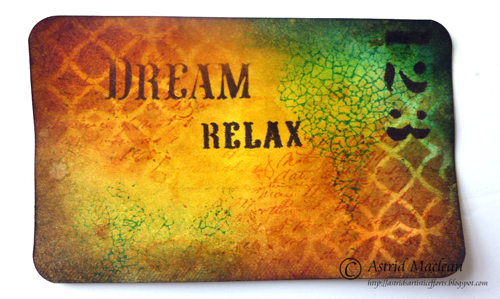 I think anyone in the world who knows the name of Tim Holtz, will immediately think of Distress Inks. 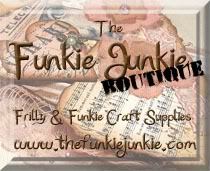 Surely it must be the most popular ink in the world for crafters. As to the technique? - Wrinkle Free must be one of the very first techniques Tim shared with us all, - you can find it on page 33 of the Compendium of Curiosities Volume 1. And Wild Honey? One of those gorgeous warm colours that was part of the very first set of colours that came out, it's been one of my favourites since I first started. And as to something 3D, well, the choices are endless right? 1. Something I had already and 2. Something that would actually be useful, and would not just sit around gathering dust. Not a bad little box and a great set of stamps, but it could do with grunging up a bit, only problem.... how to incorporate the wrinkle free technique? Solution: Cover it with some paper of course. 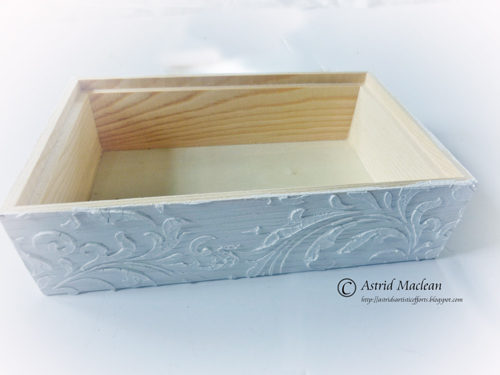 I coated the whole box with gesso, the fact that the top still shows through some of the original design, does not matter, as it's going to be covered anyway. Next I edged the lid with a coat of Distress Paint in the fabulous new brown colour Ground Espresso. I wanted some texture on the front of the box, so added some Ranger Texture Paste through the Swirls Layering Stencil, using a palette knife. That too was covered with the paint, as were the other 3 sides of the box. On to the papers that were going to cover the box: I cut a bit of Manila card stock just slightly smaller than the top of the box and rounded the corners. I also cut 3 strips to cover the non textured sides of the box. 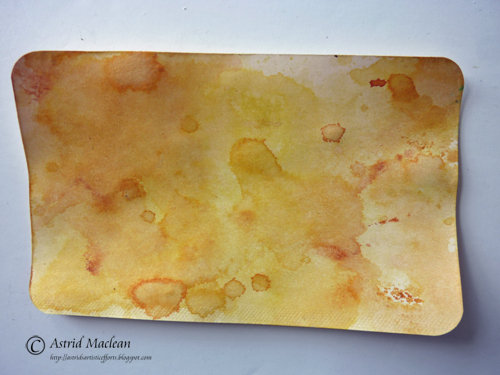 I coloured them, following Tim's description using Wild Honey and a little Rusty Hinge Distress Ink. Next I deepened the colour using my ink blending tools and applied more Wild Honey and Rusty Hinge combined with Mustard Seed, Cracked Pistachio and a tiny bit of Peacock Feather. I also did some Spritz and Flick, another of my favourite techniques. For the following layers I did some stencilling and stamping, using Tim's Lattice Works and School House stencils and some words from an old stencil in my stash (no idea anymore where it came from). 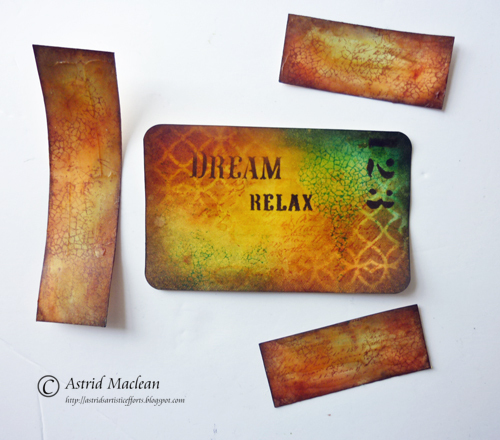 I also did some background stamping using Peacock Feathers and an Indigo Blu crackle stamp and the Ledger Script stamp from Stampers Anonymous in Rusty Hinge. To keep the words from smudging I used some sticky notes around them. I used Ground Espresso for the stencilling. 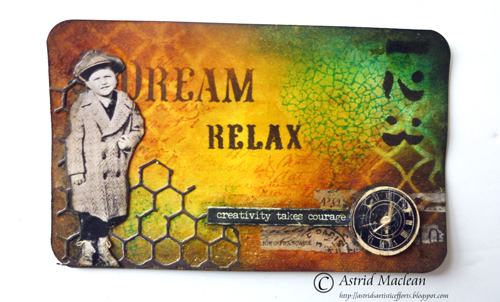 I cut some honey comb with one of Tim's Mixed Media dies, and added some Tissue Tape, a little Prima button and some words from the Small Talk stickers. The little boy is from a Found Relatives card, it is the smallest of the 3 cowboys. 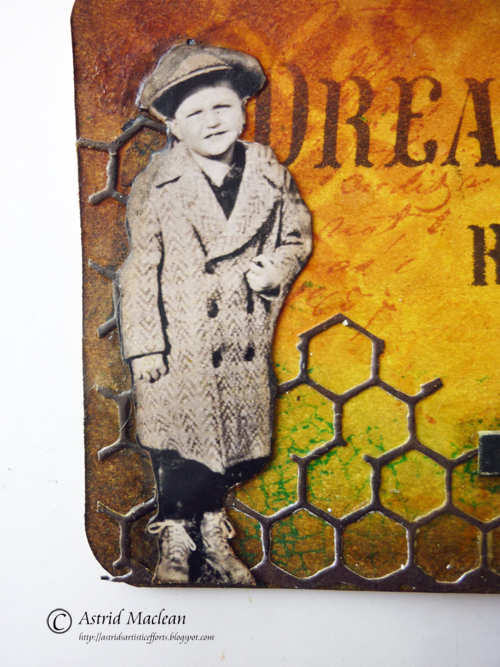 I adhered him with Glue 'n Seal and then added shadows with the Hickory Smoke Distress Marker. I sanded the edges of the word sticker and then also added some shadows with the marker. 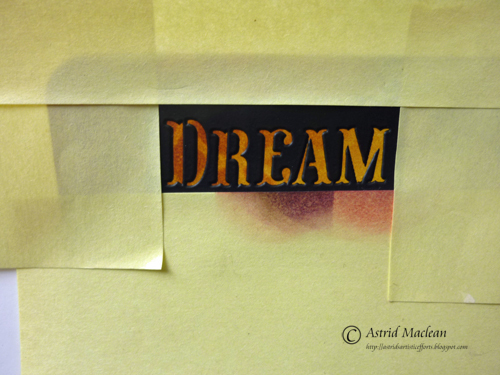 Below you can see a close up of the lid after I adhered the paper to the box with gel medium. 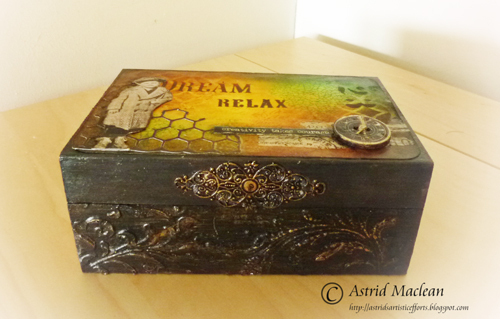 The front of the box was embellished with a filigree embellishment coloured with Alcohol Inks in Mushroom and Espresso. Next week another creative guide will take you on the next leg of the journey, having packed the same ingredients into their travel bag. Meanwhile, why not play along in our current challenge "Home Sweet Home" if you have not done so yet. We hope to see you there and happy travels!! wow.. what a fantastic alteration! Gorgeous! 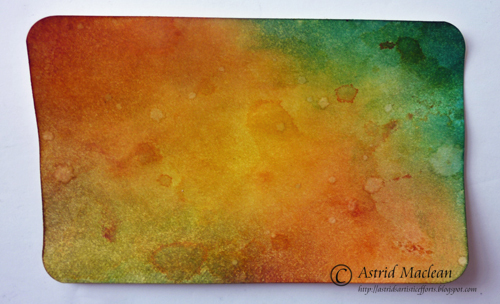 Wild Honey is one of my favourite distress colours, especially used with Rusty Hinge. 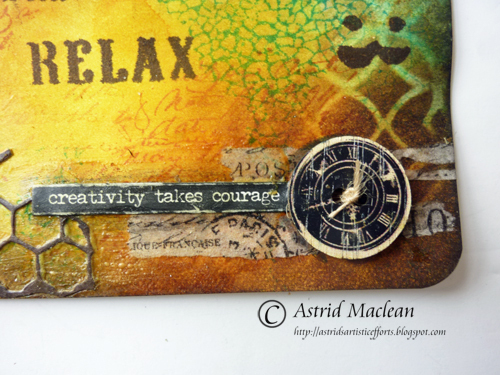 Fabulous altered box, Astrid! 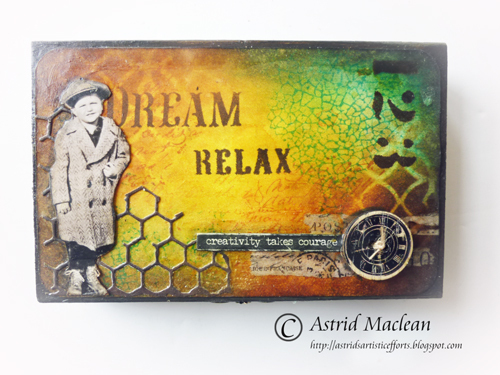 Absolutely love the colors you used on this gorgeous grungy box! Absolut stunning work here as always Astrid, I just LOVE your box here, and your work on it is really mindblowing, and it has transformed this plain box into a real masterpiece of beauty. I absolutely LOVE it. A glorious return - the glow of the Wild Honey is fabulous with the other autumnal colours, and the textured flourishes on the front look amazing in Ground Espresso (yum!). 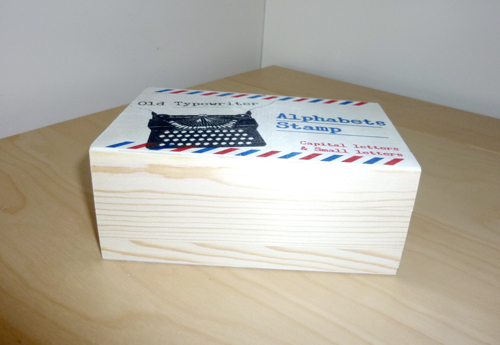 I love how you've used the honeycomb too - altogether a wonderful makeover for that little alphabet box. A great looking box now. ..so colorful. Loved to see your techniques come alive in this transformation. Love this box, Astrid! It will make such a lovely addition to your work area! The texture and design are absolutely beautiful! Certainly have missed you! 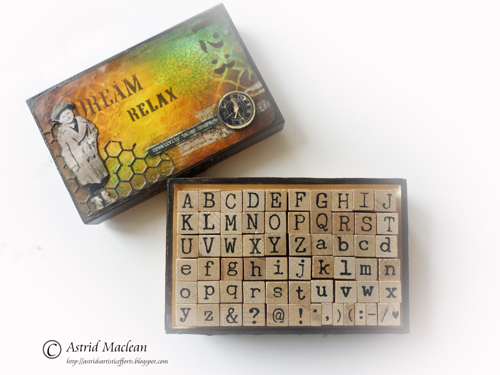 Astrid, this altered box and all the details are lovely! Love the texture and rich colors! Very inspiring and now I am going to finish one of my cigar boxes! Welcome back! What an amazing transformation Astrid with wonderful techniques and a super tutorial. Love your box. You are off with a bang Astrid - this is just INCREDIBLE. Your work is always something I look forward to seeing. 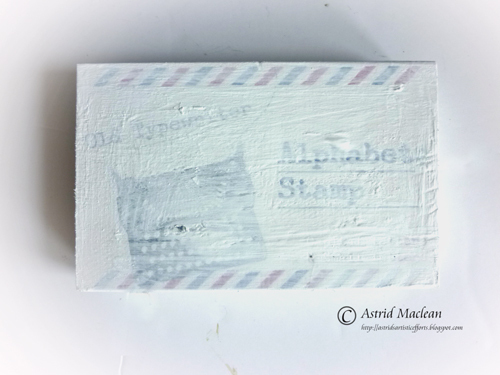 Your box decor is perfect for that wonderful stamp set. Thanks bunches for sharing the steps. Just love this. j.
NOPE, not bored at all; WOW, what an excellent job you've done on this box; I have several of these & now you have my mind in action! TFS!! Gorgeous, Astrid! What a transformation! I love that you used something useful that you already had and gave it such a new look! Love all of the layers and the colors. Great pictures of the process! Thanks for sharing. Astrid WELCOME back !! You have certainly been missed ! 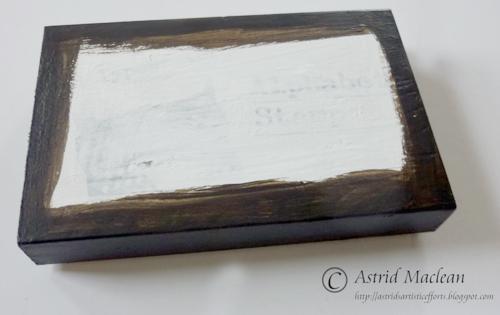 And coming back with such a project confirms that I have missed your blogging, sharing art and to learn from you..I LOVE this little box. You did an amazing job transforming into one of your awesome pieces of ART. Love the colors, adore all the details and embellishment. Your stencilling looks perfect. So nice to have you back. 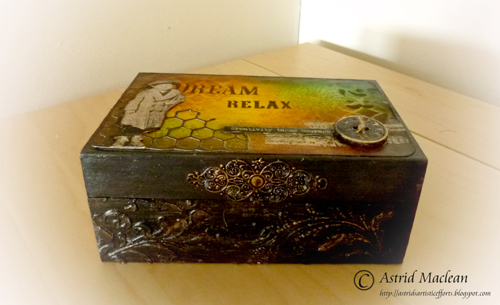 Thank you for sharing this box's transformation by a great step by step. Welcome back Astrid and with such a stunning project. Loved the transformation process, thanks for sharing the pics. 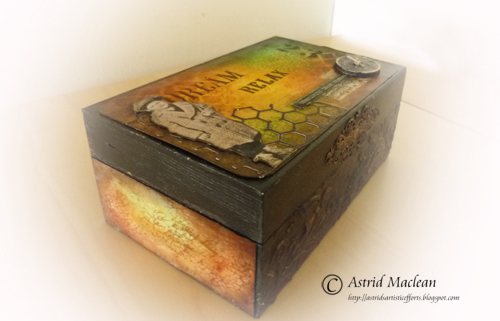 Gorgeous colours, texture and details add such a depth to this little box.